Our homes today are filled with electronics and appliances that make our lives easier and provide us with entertainment. DVD players, big screen TVs, video game systems, and cable/satellite TV boxes overload our electrical outlets and fill up our entertainment centers. If you bought a new appliance lately, you'll see that technology has changed them, as well. Our new washer and dryer consists of a few buttons and touch screens. While the touch screens look cool, there's more circuitry in them, which could lead to a fire. According to the National Fire Protection Agency(NFPA), 501,500 structure fires were reported in the U.S. in 2015. These fires resulted in 2,685 deaths, 13,000 injuries, and $10.3 billion in property damage; $7 billion in property losses were caused by home fires. Based on these statistics, a fire was reported every 63 seconds. Since I'm an insurance person, it drives me nuts when my wife insists on running our dishwasher or wash machine and dryer when we're not home. 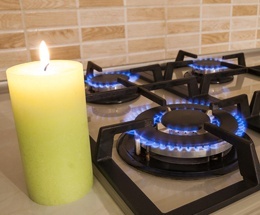 Here's a list of common appliances and how they can be start fires in your home. Dishwashers. Have you ever opened your dishwasher immediately after it finished its cycle? The heat that shoots out when you open the door can be overwhelming. A dishwasher contains heating elements that dry your dishes. These heating elements get wet, heat up, and cool down every time you use the dishwasher. Old or faulty elements can start a fire. Never turn on a dishwasher before leaving your home. While it's nice to return to clean dishes at the end of the day, it's not worth the risk. Dryers. I've written a couple safety articles about lint buildup in a dryer and the importance of cleaning it often. To see how fast a lint fire can start; check this link. Preventing dryer fires: Experts say keeping your lint trap clean is just part of the safety cycle. Toasters. In 1913, Westinghouse debuted the first two-sided toaster. Toasters have electric elements inside that are used to brown your bread or bagel. If the toaster fails and doesn't turn off, a fire can start. Never leave a toaster unsupervised and remove the crumbs on the bottom of the toaster regularly. In addition, inspect the electric elements for stuck crumbs. Candles. While candles look nice and add ambiance to your living room, never leave them unattended. From 2007 – 2011, the NFPA reported 10,630 candle fires resulting in 115 fatalities and $418 million in property damage. Electrical. Electrical fires can start in many ways. Some causes are old wiring, an overloaded electrical outlet or circuit breaker, and extension cords. The next time you plug in that extension cord or new electronic device, pay attention to your outlet. It may be wise to unplug something else or find a different outlet. Children playing with fire. If you talk to my parents, they'll tell you they're glad their house is still standing. Looking back, I ruined quite a few things in their home. Unfortunately, playing with fire made the list. According to the NFPA, an estimated 7,100 home fires occur each year because of children playing with fire. Cooking. Have you ever left the kitchen for just a “quick second” and returned to a boiling pot overflowing? The number-one cause of house fires is cooking. Consider replacing appliances before something goes wrong. A more expensive appliance doesn't equate to a longer life span. Develop and practice an escape plan with your family. Don't use water to put out a grease fire. Store matches and lighters out of a child’s reach. Avoid using water to extinguish a candle. Don't use candles during a power outage. Rely on flashlights instead. Clean your dryer lint screen regularly. Unplug toasters after each use. Inspect your dryer ducts each year. Don't store a toaster on your counter if you have pets. Contact an electrician if you're concerned about a wiring issue in your house. Select the right extension cord for the job. Avoid storing things in your microwave. Never run an appliance, such as the dishwasher, washing machine, or dryer when you're not home. Test your smoke detectors regularly. Consider replacing batteries when Daylight Savings Time begins and ends. If you have a fire in your home, the most important thing you can do is get out immediately. A home can be completely engulfed in flames within a couple of minutes. The safety of you and your family is more important than your possessions.